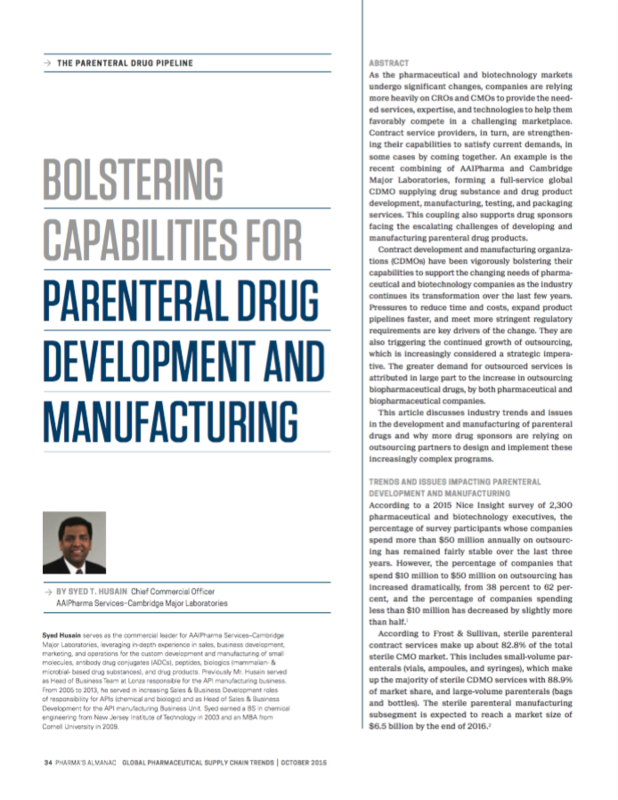 As published in Pharma's Almanac Q4 2015. As the pharmaceutical and biotechnology markets undergo significant changes, companies are relying more heavily on CROs and CMOs to provide the needed services, expertise, and technologies to help them favorably compete in a challenging marketplace. Contract service providers, in turn, are strengthen- ing their capabilities to satisfy current demands, in some cases by coming together. An example is the recent combining of AAIPharma and Cambridge Major Laboratories, forming a full-service global CDMO supplying drug substance and drug product development, manufacturing, testing, and packaging services. This coupling also supports drug sponsors facing the escalating challenges of developing and manufacturing parenteral drug products. WILMINGTON, NC – October 1, 2015 – AAIPharma Services Corp. / Cambridge Major Laboratories, Inc. (AAI/CML) has recently expanded its service capabilities to offer two sites as options for placement of Disinfectant Effectiveness/ Disinfectant Qualification (DE/DQ) studies. In order to meet a high customer demand, provide regional supportand complement the existing services from the Edison, NJ, facility, AAI/CML now offers DE/DQ at its St. Louis, MO facility. These studies satisfy the requirements of USP <1072> Disinfectants and Antiseptics and support clients with their needs to comply with cGMP 21 CFR 211.67, Equipment Cleaning and Maintenance. The expansion allows AAI/CML to further support sterile and non-sterile product manufacturers in the development and qualification of disinfectant programs to prevent microbial contamination through pharmaceutical ingredients, process water, packaging components, manufacturing environment, process and manufacturing equipment.